WANCHESE — Baby oysters have a new habitat here along the shoreline near the North Carolina Coastal Federation’s northeast office. 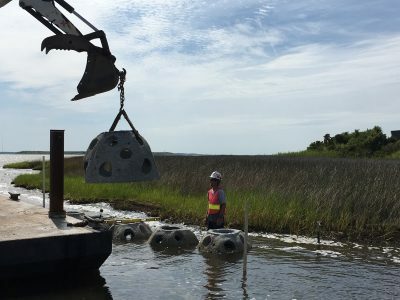 Around two dozen concrete oyster reef balls weighing in at 1,300 pounds each, were deployed last week along 100 feet of shoreline, giving baby oysters plenty of space to attach and grow, the federation announced Wednesday. Over the next two years, the oyster reef balls will recruit oysters, helping to improve water quality in Broad Creek. These oyster reef balls will help create more habitat around the shoreline that can provide foraging and refuge areas for important fish species. Area contractor, Total Marine Services, deployed the 25 oyster reef balls measuring at 3 feet by 4 feet apiece near the federation’s office in Wanchese Marine Industrial Park. The reef balls are adjacent to a 100-foot sill built by volunteers out of recycled oyster shell and show two different ways oysters can be used to create habitat and protect the natural shoreline, according to the release. One of many projects being built at the federation’s offices, the staff continuously works to demonstrate techniques for building oyster reefs, protecting natural shorelines and limiting stormwater runoff from entering nearby coastal waters. “We look forward to educating everyone about these techniques. Already we’ve been using the oyster bags along the shoreline in our summer programming,” said Sara Hallas, coastal education coordinator, in a statement. The project is supported by Camp Younts Foundation and the National Oceanic and Atmospheric Administration’s Community-based Restoration Program. 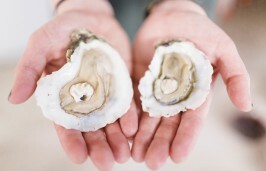 Oyster restoration is one of the federation’s major initiatives. By 2020, the organization plans to restore 50 acres of oyster reef through its 50 Million Oyster Initiative.